In a world where everything is rapidly moving further and further into the digital space, companies and organizations now know that this is the secret to success. 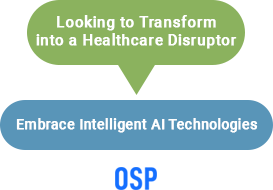 Sound investments that are software and AI technology oriented have the potential to provide healthcare organizations with a distinct competitive advantage and enhanced patient-physician experiences. This is enabled through intelligent technologies, AI-driven algorithms, smart software, and superior quality automated analysis, which translates into higher profits. It is your road to transforming the organization into a healthcare disruptor, a benchmark that competitors seek to aspire. 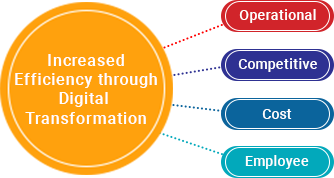 In a nutshell, digital transformation signifies a dynamic change made by the company or organization to transition from traditional modes of operation and processes to technology-driven strategies and competencies. As opposed to the traditional methodology of outsourcing certain requirements related to technology, AI-driven transformation requires the enabling of intelligent technologies within the core of the business for an improved bottom line. When an organization seeks to make the transformation from traditional approaches to modern technologies, requires a change in perspective, a transformation of infrastructure and a restructuring of the organizations core values. The crux of digitized success is built on the concept of interconnectivity. Technologies that connect patients with physicians, clinicians with physicians, clinicians with patients and their data with meaningful interpretations and billing related methodologies – these are but a few examples of AI capabilities in healthcare. There are several ways to leverage AI technologies for higher efficiency and improved results. One such way was adopted by Brockton Hospital, Boston, USA. This healthcare system installed activity trackers and connected their blood pressure monitors and scales to improve the treatment of chronically ill patients and those in recovery. The technologies installed allow the clinicians tracking of daily changes in weight, heart rate, movement, sleep and blood pressure for a personalized consultation with patients through telehealth and messaging services. Further, the clinician gets a real-time update, through this tracking, to intervene and draw the physician’s attention to the condition of the patient. Many advantages were realized through this adoption. 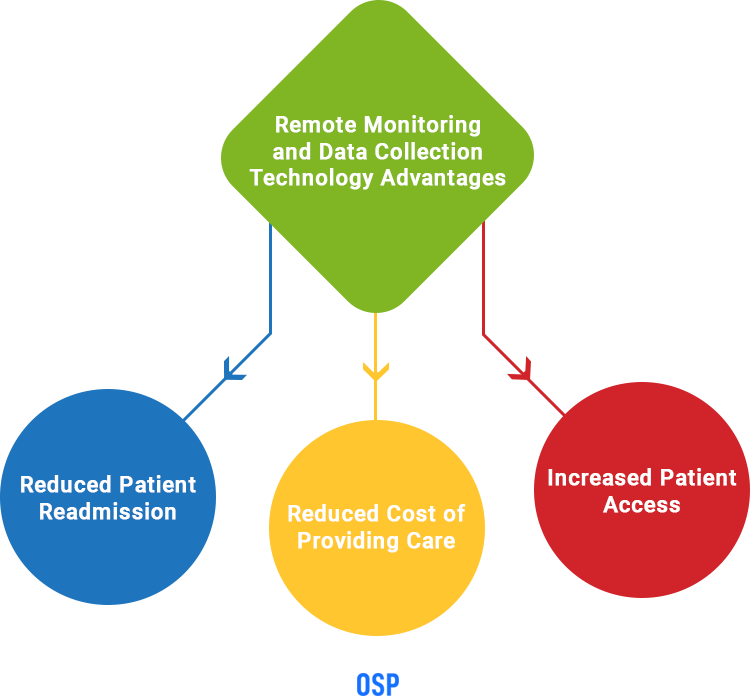 First, the remote monitoring and data collection feature considerably reduced the cost of providing care through reduced patient readmission and increased patient access to physicians and clinicians. Operational Efficiency:When intelligent AI-driven technologies are adopted, the operations of the organizations are immediately improvised. Patient experiences are enhanced through better access to healthcare, employee satisfaction is increased through automated and swift methodologies, and physicians receive meaningful and time efficient ways of providing care. Therefore, the holistic operations of the organizations are swiftly optimized with less attention to maintenance and more to innovation. Competitive Efficiency: Improved patient experience directly translates into a higher volume of patients and provides the organization with a competitive advantage in the industry. When the systems are optimized and automated, the organization is more likely to attract patients that are dissatisfied with their current healthcare provider. Cost Efficiency: With digitally powered systems and a higher volume of patients, the cost of providing healthcare is reduced, along with an increase in profits through efficiency and higher patient interaction. The needed for added employees, that are required for mundane work, is reduced and therefore, the overall cost to the organization is also reduced. Employee Efficiency: Efficient systems and methodologies take a considerable amount of burden of clinicians, physicians and administrative employees that waste their time with mundane updates. Additionally, the higher amount of patient satisfaction and operational efficiency within the organization boosts the morale of the employees and attracts talented physicians to the organization. Segregated software and systems cause disintegrated accumulation of information with a lack of interconnectivity for meaningful analysis. Through the use of open systems that work on the concept of interconnectivity, data is collected in an automated and intelligent manner to make meaningful derivations. Administrative staff is required to physically monitor and study patient data and historical references to accumulate information that is relevant to their healthcare. AI-driven technologies automatically analyze historical patient data and search through volumes of reference to provide a holistic and efficient report to the physician through predictive analysis. Billing and Claims were manually prepared, which were prone to human errors and resulted in higher claims rejection. Automated billing and claims preparation systems create bills and flag errors related to claims that reduce rejection and loss related to time. Healthcare providers are continually struggling with slow systems that put increasing pressure to cut down on patient costing, providing higher quality service, increased accessibility, etc. A healthcare provider network management system allows caregivers access to a universal platform under an umbrella that provides easy communication and connectivity. Decreased patient access to healthcare through manual scheduling of appointments and physical visits for consultation and physician care. With technologies that provide online visits and telemedicine patients are experiencing remote consultation with their physicians, which results in higher profits and patient satisfaction. Strict payment models that increased the burden of administrative staff and decreased the advantage of the patient. Innovative payment models that seek to lower total cost of care and provide patients with higher quality of service. Healthcare organizations that are looking to transition from traditional systems to modern systems with AI-driven technologies have already taken their first step toward digital transformation. OSP labs holistic cloud technologies and robust applications and solutions create an infrastructure for healthcare organizations to turn themselves into digital disruptors that provide their patients with a distinctly higher experience. Our focus remains on what our client needs and OSP Labs is pledged toward providing robust and agile healthcare software solutions that address complex business needs through customized solutions. Below is a snapshot of how we have helped our clients achieve digital transformation by addressing their specific business challenge. Challenge: Reduced reimbursement due to faulty tracking of retroactive Medicaid bill status. Solution: A cloud-based system that would efficiently access and track unworked reimbursements. Daily monitoring of self-pay, sliding fee encounters and patient accounting system. Capturing of eligible retroactive Medicaid and alerts that include necessary billing details for timely execution. Date range-based payment reporting features and viewing of audit trail past transactions. Result: OSP designed a system architecture that allowed access to details of unworked items through in-depth diagrams, report layouts and designs. Through the interconnectivity of the client’s existing system with the agile application, we were able to provide a holistic viewing of retroactive Medicaid reimbursement status. Every reimbursement encounter was monitored and overall efficiency was increased. Challenge: Traditional and outdated manual paper-based billing process creating a huge stress on billing management workflow due to increasing number of patients under the dental health coverage. Solution: Tailored & HIPAA compliant cloud-based dental health billing platform. Robust encryption that ensures security of patient data. Other features included HIPAA compliance, denial management tools and multiple user components. Distinct prototypes for different modules among the entire billing system. In-depth system architecture that enabled the streamlining of the entire software development lifecycle processes. Code-wise payment tracking, automated super-bills, and uniform codes across billers and reviewers. Result: The client received a customized solution that automated the entire dental health billing system through 100% compliance and secured private patient data flow. Claim denials were managed through easy provider network management and electronic remittance advice, EOB and zero down unpaid bill ratio. Challenge: Healthcare reimbursements being affected due to small coding errors causing a negative impact on overall revenue cycle. Length processes, HIPAA compliance and patient privacy for preventing frauds. Solution: Cloud-based and real-time claim data management solution. Real-time, web-based tailored application to manage patient’s claim information with AWS cloud hosting. Custom claims, feasibility analysis, and shared user management console that provides easy accessibility to claims documents. Three-tier systems architecture for comprehensive project development and user-friendly approaches. HIPAA compliant, PCI compliant, W3C compliant and AAA compliant. Client accessibility to manage information, updates of status, and sending of notifications. Automated reminders for claims nearing deadlines. Result: OSP’s customized claims data management software enabled faster claims processing and a distinct reduction in rejections and denials. Overall cost was further reduced through automated claims status verification. Although there are some hesitations among healthcare organizations, when it comes to AI, the benefits of the technology are making a strong impression. AI is a universal term that is generally used to define any task that a computer can perform more efficiently than humans. However, there are several different types of intelligent technologies, including the ones with intelligent algorithms, which require human intervention. As the competitive advantage that comes with AI investment is further realized, entrepreneurs will continually invest in AI technologies. Machine learning capacities are growing by leaps and bounds. The traditional methods of operation are falling short in meeting the increasing demands of consumers in the healthcare industry. Healthcare CXOs can focus their approach businesses toward integration of technology advancements, through digital transformation, to increase the overall efficiency of operational processes. Leveraging AI technologies has proved significantly successful in delivering a higher quality experience to patients, employees and customers alike. As the healthcare culture moves further toward the value of care, advanced data technologies, mobile and cloud technologies have disrupted the industry. Finally, when considering which technology is appropriate for your organization, the right approach is to avoid the herd mentality and undertake a detailed analysis of the needs of the organization. The focus should remain on engaging with the consumers to the highest extent possible.